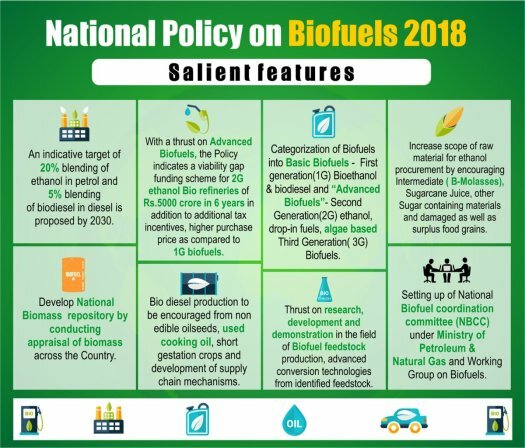 Government wants to reduce the country’s oil import dependence Rajasthan became first state in the country to implement National Policy on Biofuels unveiled by Union Government in May 2018. Its implementation was approved by the high-power Biofuel Authority. Under this policy, State Government will lay emphasis on increasing production of oilseeds and establish Centre for Excellence in Udaipur to promote research in fields of alternative fuels and energy resources. Biodiesel plant of capacity of eight tonnes per day already has been installed in the State with financial assistance of Indian Railways. State government will give emphasis to promote marketing of biofuels and generate awareness about them. State Rural Livelihood Development Council will also encourage women’s self help groups (SHGs) to explore the scope for additional income through supply of biodiesel. 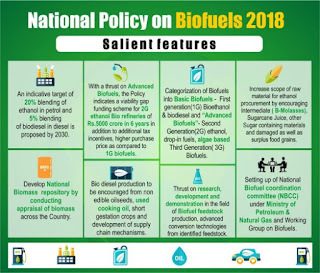 The policy categorises of biofuels into first generation (1G), second generation (2G) and third generation (3G) to enable extension of appropriate financial and fiscal incentives under each category. It seeks to help farmers dispose of their surplus stock in an economic manner and reduce the country’s oil import dependence. It has expanded the scope of raw materials for ethanol production by allowing use of sugarcane juice, sugar containing materials like sweet sorghum, sugar beet, starch containing materials like corn, cassava, damaged food grains like broken rice, wheat, rotten potatoes which are unfit for human consumption, for ethanol production. It also encourages setting up of supply chain mechanisms for biodiesel production from non-edible oilseeds, used cooking oil, short gestation crops. Q. Which state became the first state in the country to implement National Policy on Biofuels?